I wanted to show another image from Osorno, in Chile. This was the first little town I stopped in on my recent trip down there, and I got an opportunity to go out and explore the town a little. I was very fortunate to see this parade of your people marching down the street. The musicians played with a vibrancy and a passion that was infectious. These kids absolutely LOVED it. Osorno is a town of nearly 150 000 people, in the Los Lagos region of Central Chile. Home to several university campuses, Osorno is a student town. Osorno is also on the main route south from Santiago, and one of the main routes into Chile from Argentina, which makes it a busy little town for travel and tourism. Just south of Osorno is Puerto Varas, a beautiful little coastal town. Osorno is a great little destination for jumping off on any of the numerous adventures Chile is home to: trekking, rafting, climbing, fishing, skiing, and more. Hopefully, I’ll get back to Chile for some more travel before long. 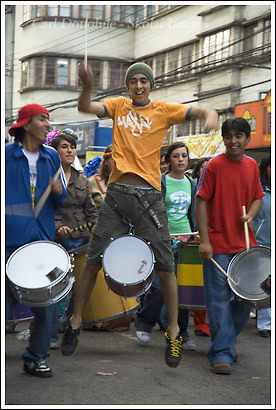 This entry was posted in Chile, People, Travel on April 24, 2007 by Carl D.